A year ago Fenway Park was preparing to transform into a soccer pitch, hosting two world-famous clubs in an exhibition match that would set the Fenway Park record attendance for a soccer game. On July 25, 2012, Liverpool FC visited the Boston ballpark in a game against Italy's AS Roma before 37,169 fans. 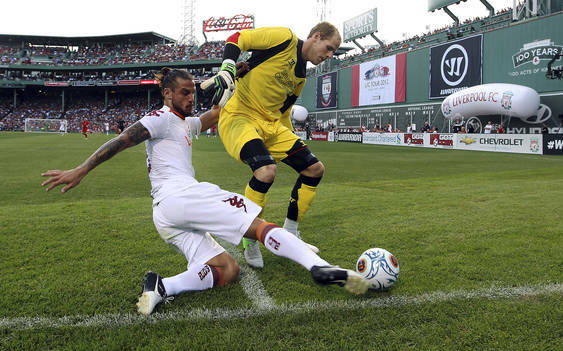 Not only did the match attract a large crowd from the soccer enthusiasts, but the game was also televised live on ESPN2, in a successful night for Fenway Sports Group, owners of the Boston Red Sox and Liverpool. So why can't the group continue the baseball-soccer connection, and keep the successful event as an annual tradition? Let's start with the fans. Although the New England Revolution do not always get the support they deserve, there still is rich soccer roots in Boston. International matches at Gillette Stadium routinely draw well, and have become a staple at the stadium in Foxboro. A recently announced international friendly at Gillette between Brazil and Portugal will take place September 10, in what is sure to be a highly attended event. In addition to last year's record setting soccer attendance at Fenway, a 2010 match between Scotland's Celtic FC and Portugal's Sporting drew 32,162 fans. It is apparent that Boston can support international soccer, and given the last two events at Fenway, having Liverpool make an annual appearance in Boston seems to be more a matter of scheduling and travel than fan support. Liverpool's preseason "LFC Tour 2013" currently lists stops in Indonesia, Australia and Thailand. Making a stop in Boston is undoubtably not as easy as simply flying the teams over, a North American stop here would have to be worked into the tour's travel plans accordingly. There's one thing that is for sure, the numbers don't lie. Although 37,000-plus fans at Fenway is not exactly impressive to international soccer, having an extra event with such magnitude at the ballpark would be beneficial for the Red Sox, who continuously try to add events to make Fenway Park a host for more than just 81 regular season games. Additionally, having Liverpool visit Fenway would strengthen the relationship between the two Fenway Sports Group assets, possibly creating new fans between the two clubs. Will Liverpool ever make Fenway a yearly stop? Most likely not. But for all of the complications that travel and scheduling can bring, the rewards of building a stronger relationship between clubs and enhancing an international brand for Liverpool are tough opportunities to waste.